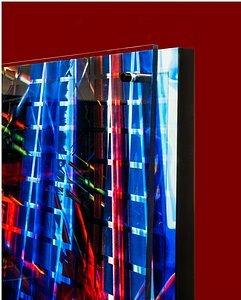 The pinned image presentation is constructed with either an acrylic base or aluminum base along with a suspended acrylic top image. The two images can be mounted to a wall by using a French cleat and or wire and ring hanging system. The base image is back mounted on optically clear acrylic. The top image is printed directly on acrylic and mounted above the base image. The picture above shows the images are combined by using a black aluminum pinning system. 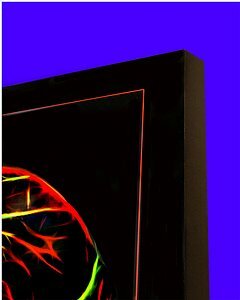 The Aluninum base image presentation is constructed along with a suspended acrylic top image. The two images are held together with a 3/4" metal frame mounted to the back of the base. The frame has a wire hanging and or a French Cleat hanging system. The single image presentation is generally constructed with a single die sublimation on aluminum. The image is mounted on a thick metal frame, aproximately 1.5" wide, on the back. The frame has a wire hanging system.